I’ve been sitting here for a bit staring at a blank screen, not quite sure what to write for my Storytime Saturday post. Which lead m to start thinking about the things I miss in games. One of the casualties of the whole Daybreak Games debacle was the majority of the in game GM department. From what I have heard they currently have only a single GM per game, which makes me wonder why there is not talk about bringing back the Guide program. For those who are not familiar with the concept, the Guide program was a series of player volunteers that gave up some of their in game time to serve as junior GMs on a server other than their own. These guides took care of a lot of the day to day requests like players stuck in geometry, and minor behavior infractions. The guide system always felt really cool because you knew more than likely you were getting another seasoned player helping you out, and in part you felt more connected to them because of it. This freed up the GM staff to do some interesting things like live events. It was always extremely awesome when something was going on, and it was amazing how fast word trickled through the community. Players would drop what they were doing to flock to whatever zone something cool was happening in. The unfortunately thing is it has been literally years since I last participated in something like that. Modern games seem to have a GM staff that simply does not come out to play anymore. There was a time when on Xegony in Everquest we knew all of the GMs and guides assigned to our server. There were so many times they would be hanging out in zone with us as we took down a raid boss, cheering us on. The problem is there were tales of GMs doing questionable things to help out some of the top tier guilds. I really hope they were just rumors, because while we might have had GMs in zone with us they never did anything to assist us other than to lend moral support. 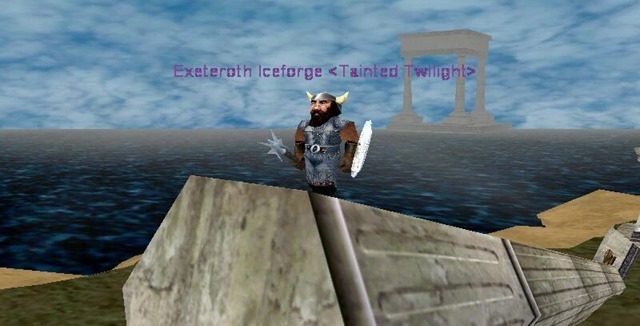 One of the rights of passage in Everquest was the obtaining of the epic weapon. This was an extremely long process that involved the camping of many rare spawns. I’ve talked in the past about playing a cleric which was actually one of the less annoying epic weapons to obtain. The worst ones relied upon steps in raid instances that were extremely rare spawns. I remember getting home from work, logging in and seeing messages in guild chat that “Pasta” was up, and everyone immediately knew that it meant we were going to the Plane of Hate that night. 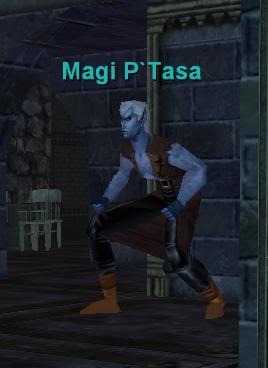 Magi P’Tasa was a super rare spawn on what I vaguely remember being a two week long spawn cycle buried deep within the Plane of Hate. When it was up… it became a race among all the various raid guilds on the server to see who could field a raid first and clear to it and defeat it. So many times there was a fever pitch battle to try and log people in fast enough, and get us all into Hate in order to grab the spawn rights first. That was one of the awesome things about Xegony is that for the most part the raid guilds respected each others “spawn rights”. Meaning that if someone was in a zone, it was more or less off limits to any other guild trying to come up and muscle them out of it. So whoever gained a foothold in Hate for example, owned Hate until they were doing farming it. These farm sessions could last days at times, especially on the weekends. This however was not the case on every server. Originally I started on Veeshan, the home of the fabled Fires of Heaven raid guild. They respected no ones “spawn rights” in any form, and there were constantly tales of them steamrolling their way through a zone that someone else was currently farming to muscle through to the spawn they needed. Often times training mobs on the rival guild to keep them busy while they got what they were after. I feel like in part the reason why we have instanced dungeons in World of Warcraft, is in part because of these sort of shenanigans. The cool thing is that while all of this was going on, it was not unusual for guides and GMs to be hanging out watching the race for the spawn. I have to say the coolest instance of GM intervention I ever experienced was while I was working on my own epic weapon quest. 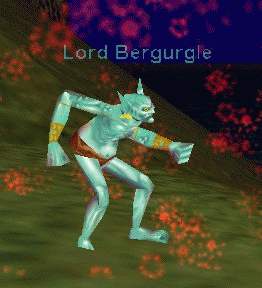 At the bottom of Lake Rathetear was a particularly annoying step that involved farming a set of Aqua Goblins until a rare named goblin called Lord Bergurgle spawned. Like so many of the spawns in Everquest this on was based on a random chance anytime you killed the placeholder. This often meant spending hour after hour on the bottom of Lake Rathetear which was a slog of a camp because the bottom of the lake was pitch black…. with nothing other than some crumbling ruins to stare at. During one of my sessions down on the bottom of the lake a random GM popped by and spend several hours just keeping me company as we waited on the spawn. It was awesome that she was more than happy to chat away keeping a lonely cleric company while waiting on an annoying spawn. Basically I miss this sort of interaction between the customer support staff and the player base. During these early days there was so much more cooperation between players and customer service, because it felt like we were in this together. That we were working together to make this game we both loved all the more awesome. I am not saying that CS is not doing an amazing job currently, but I miss this era of manual and personal intervention with the players. The GMs and Guides were physically in the game with you, not connected into it through a chat server in a call center somewhere. In part it was also cool that “guide robes” were something that was instantly recognizable as a person of authority. It was like a uniform that every player immediately recognized and respected. They were the in game security guards and forces of right and good. I keep hoping now that we have these smaller niche games that they will bring back something like the guide program. I think it is good for the community as a whole to have representatives in direct contact with the player base on a regular basis. If nothing else it is fun to fondly remember this era in MMOs, even if I doubt it will ever fully return. I feel like this is probably something that gets harder to support the larger the game gets.